Deep Creek Canyon is a hidden gem of Spokane County that is located in Riverside State park. It is the remnants of ancient basaltic lava flows that have been carved out by cataclysmic glacial floods. The valley holds a bounty of discovery through its channeled canyon and vertical walls. A rock climber’s dream and an adventure to any hiker or horseback rider. The carved-out river bed holds a bounty of boulders and alluvial sediments of all kinds. The river bed is also where palagonite or pillow basalt can be found. What is pillow basalt? It is a type of rock formed by molten lava encountering water or heavily saturated ground sediments, such as a wet land or marsh. Some classic features include “radial jointing, glassy rinds, hollow interiors, hyaloclastic breccia, and orange palagonite alteration” (Bjornstad et al., 2007). Simply put, as the lava enters the water, a barrier of steam is formed around the lava pillow. Waves or other disruptions cause a break in the steam barrier, allowing gasses to enter the lava. 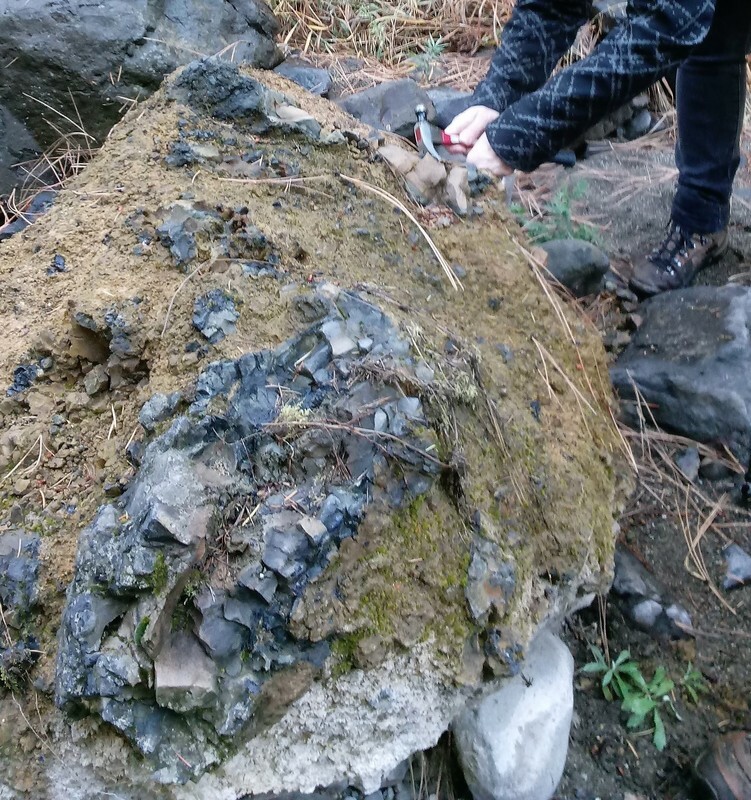 Therefore, matrices of shiny black basalt fragments (hyaloclasite) form (Reidel et al., 2013), causing tremendous textural features that stand out amongst the plain grayish brown basalt. 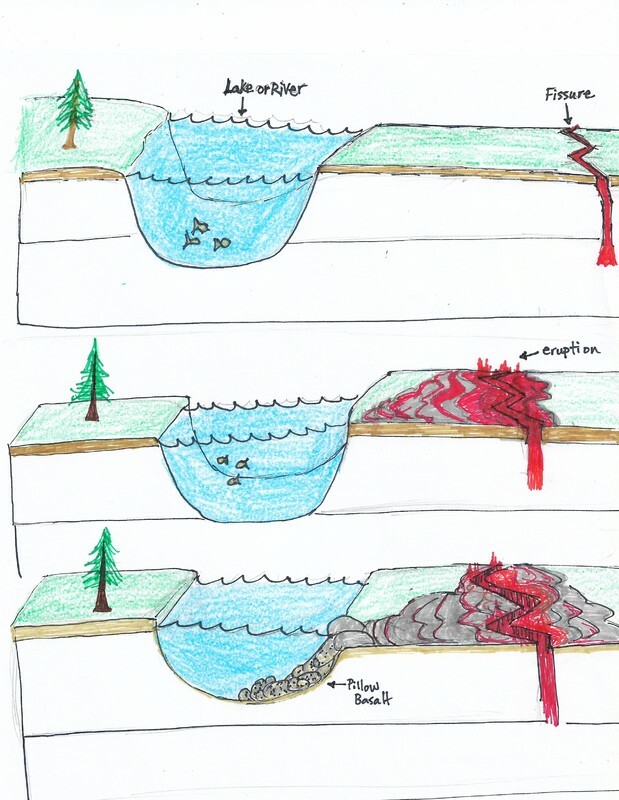 As the lava progresses it picks up sediment from the aqueous environment. Some palagonite has been known to have seashells and barnacles stuck in them as well. Next, a short history of the region is needed to fully understand the formation of Deep Creek. Spokane is in an area called the Columbia River Basalt Group or (CRBG). That means this region is categorized by the type of lava that flowed from dikes or fissure systems that interconnected throughout the states of Washington, Idaho and Oregon. The CRBG erupted between “ca.16.7 Ma-5.5 Ma” (Reide et al., 2013). There are seven formations that make up the CRBG group: the Steens Basalt, Imnaha Basalt, Grande Ronde Basalt, Picture Gorge Basalt, Prineville Basalt, Wanapum Basalt, and Saddle Mountains Basalt. These formations are divided into formal and informal subgroups. 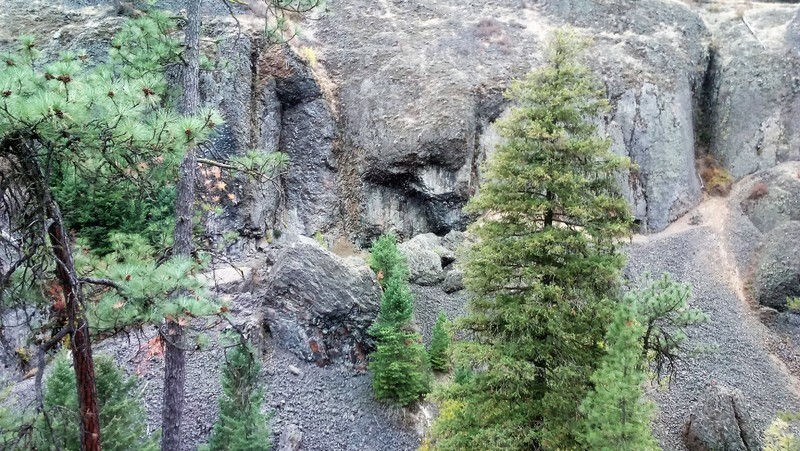 Deep Creek is a member of a formal subgroup called the Sentinel Bluffs member and its flows marked the end of the Grande Ronde volcanism (Reidel and Tolan, 2013). Finally, the channeled scablands, formed by many cataclysmic megafloods caused by glacial Lake Missoula out-burst floods. Hundreds of millions of gallons of water would rush throughout the CRBG plains and turn them into channeled scablands (Sweeney et al., 2003). Carving away sand and sediment, picking up massive boulders and depositing everything, over an area a several hundred miles across. Leaving behind a flow of alluvial sediment that would become the Deep Creek of today. The rapid incision of the valley led to numerous huge basaltic blocks falling from the cliffs and the unique topography of this unique regional destination. 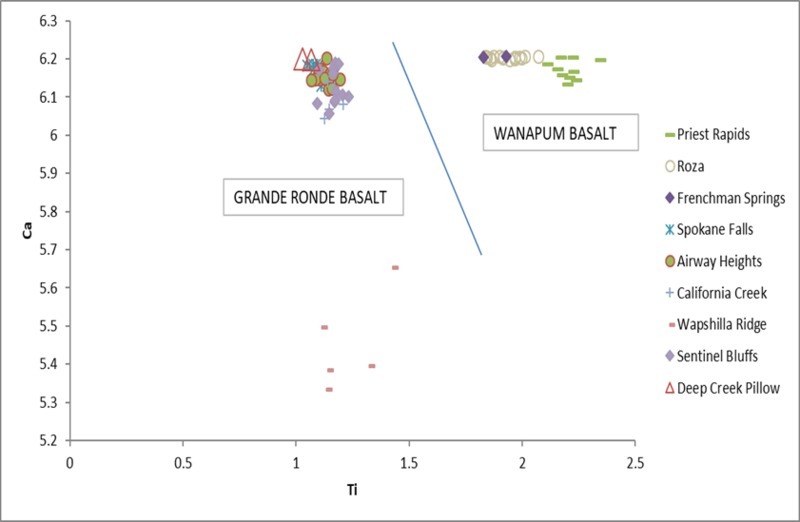 Graphs providing a chemical analysis of rock sample from Deep Creek compared to other local basalt samples. 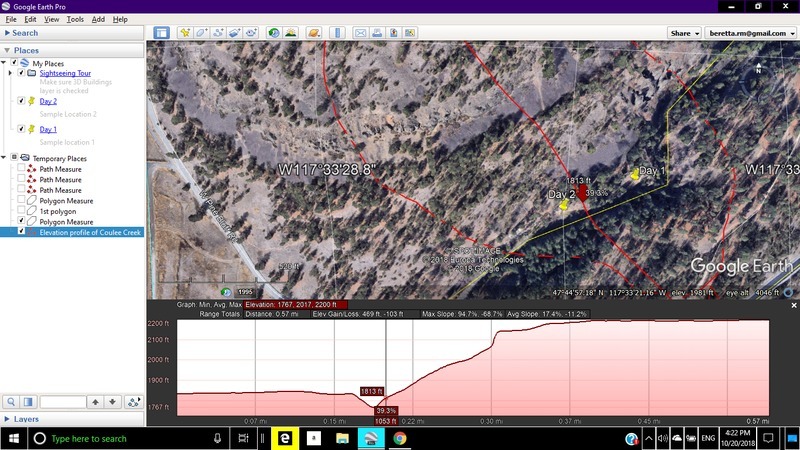 : Comparing the weight percent of Zr vs Sr shows that the pillow basalt is part of the Sentinel Bluffs member of the Grande Ronde Basalt. Analyses were conducted at Eastern Washington University using a Bruker Tracer III portable XRF. 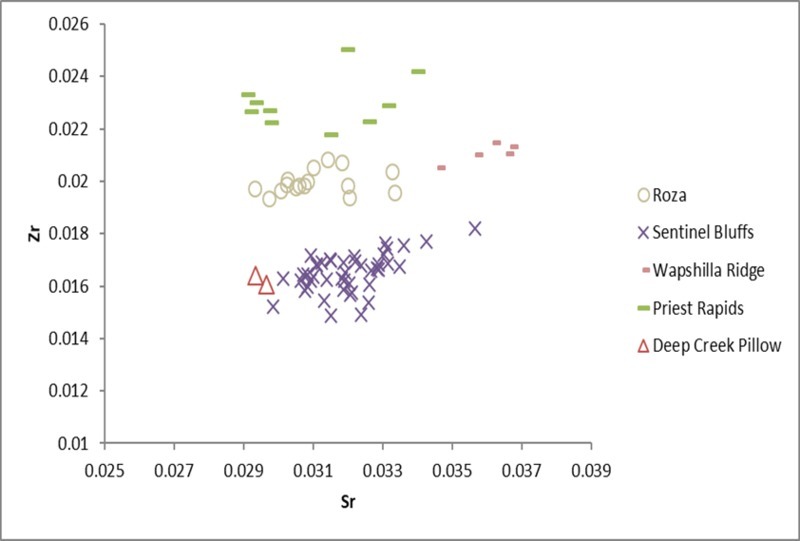 Chemical analysis of rock sample from Deep Creek compared to other local basalt samples. : Comparing the weight percent of Ca vs Ti shows that the pillow basalt is part of the Grande Ronde Basalt. Analyses were conducted at Eastern Washington University using a Bruker Tracer III portable XRF. 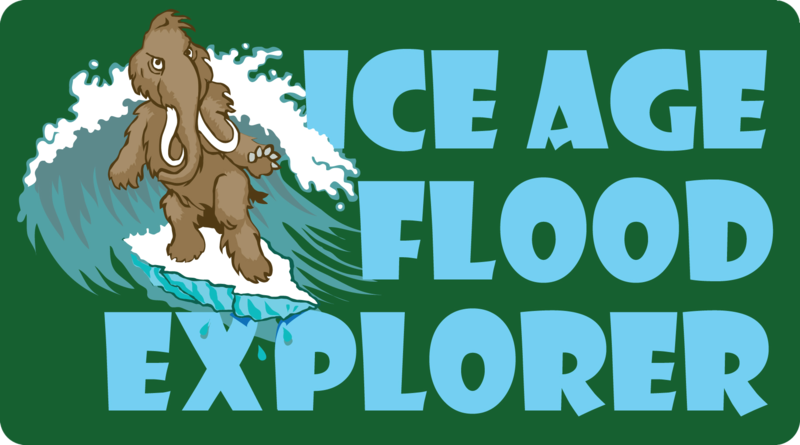 Rosilee Beretta, “You wouldn’t want these pillows on your bed: ,” Ice Age Floods Explorer, accessed April 21, 2019, http://floodexplorer.org/items/show/61.